Every breed of dog has health issues some more than others. The Shar-pei is rated as medium. Every effort is made by professional / responsible breeders to ensure that their Shar-pei and offspring are free from the common health issues related to the Shar-pei. Some of the most common health issues are, tight lip, entropian, amyloidosis, swollen hock syndrome, Shar-pei fever and skin allergies. When choosing your puppy we recommend that you visit a number of breeders. A well socialised Shar-pei makes the most superb family pet who are devoted to their owners and children. Shar-pei are loyal , playful and active yet can be very strong headed! Shar-pei are highly intelligent dogs and pick things up fairly quickly. In the Shar Pei, both POAG and PLL appear to be caused by the same mutation. Most dogs become affected at approximately 4-6 years of age. The eyes become enlarged and the lens of the eye becomes wobbly and can even fall out of its normal position. Tight hp is where the skin from the lower lip grows over the bottom teeth making it hard to eat , drink and chew. A very small minor:operation is needed to cut away the excess skin that divides the lip from the teeth. If untreated this can cause an oVer bite. Symptoms are swelling of the hocks and other joints. Reluctance to move Abdominal pain, vomiting and diarrhoea swollen painful muzzle. Shar-pei that suffer from this fever can have one or more episodes of unexplained fevers, temp usually between 103-107 during a fever, fevers can start less than 18 months old, sometimes the first fever isn't unit adulthood. Fevers can last between 24-36 hrs and in most cases without treatment. The disorder is thought to be a result from an inability to regulate the immune system. Dogs that have experienced an episode of these symptoms above should not be used/ be removed from breeding program. Grapes - Raisins - Onions- Large doses can be toxic and have fatal consequences. If a large dose has been eaten seek veterinary help immediately. Some shar-pei like other breeds and even us humans suffer allergies from hay fever to dust allergies all of which can be kept under control by Piriton, Benadryl or Clarytin tablets . 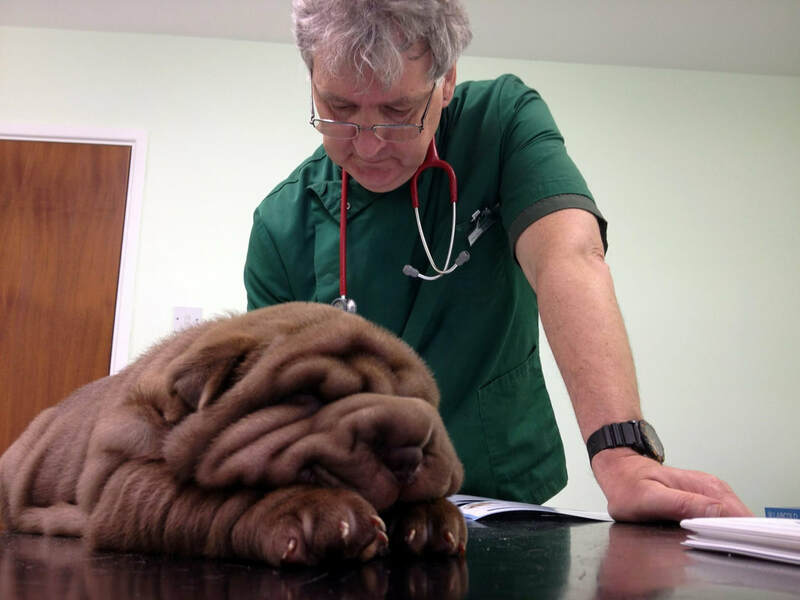 Then there are skin allergies and not every Shar-pei that has a skin allergy has Demodex mange WI So many vets- mainly Shar-pei none friendly Wrongly diagnose and treat a simple skin allergy as Demodex due to lack of knowledge about the breed. This just prolongs the situation. Diet and supplements can help with most allergies as its usually down to a low immune systems which usually causes an allergy to flare up I use these supplements myself just to keep my dogs healthy on a day to day basis even though my dogs are all fit and healthy I feel that the added supplements really give my dogs a healthy look. It is sad to say, that a lot of vets have trouble with the Shar-pei dog. They do not seem to understand the breed as the would a boxer for example.